The working week is Sunday through to Thursday. Friday is a day of prayer and an official day off. Some companies require their employees to work a six day week including Saturday. Brunches, often accompanied by alcohol, are popular past times for expats on Fridays and a pleasant way to spend an afternoon. With a long stretch of coastline, Dubai’s beaches are a popular destination at the weekend. If you’re looking for facilities, for a small entrance fee, Jumeirah Beach Park offers a children’s playground, changing rooms and a café. There are plenty of free beaches with golden sand and warm sea too. Staying in town, restaurants and malls can keep you entertained, whether you’re looking for a meal with a cityscape view, or a nibble while watching people tumble down the ski slope. Neighbouring Emirates are also not far away and whether you like to stick to the coastline or escape to the mountains there is plenty of adventure on offer. To get a better understanding of the Islamic faith visit the Sharjah Museum of Islamic Civilisation or the spectacular Sheikh Zayed Grand Mosque in Abu Dhabi, which is open to tourists every day except for Friday. For wildlife, visit the Sharjah Desert Park, which includes a wildlife centre, a children’s farm and a natural history museum. The Al Ain zoo is also worth a visit. If you want to see the 16th century forts nestled in the hillside, take a trip to Fujairah or Hatta. In land, the desert is more than just sand. 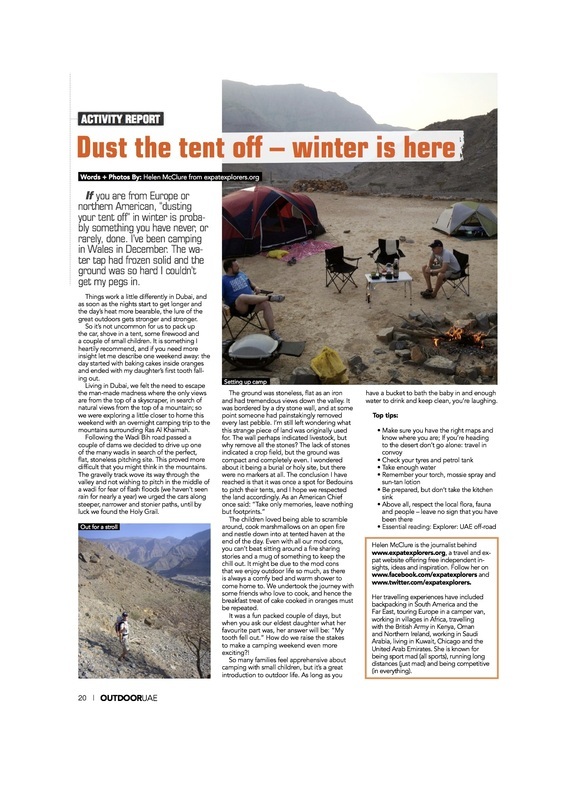 In the cooler months of winter, off-road driving (dune bashing) and camping in the desert are popular. Research the equipment and supplies you’ll need before you go, and consider taking a course in sand-driving techniques. Always make sure you travel with other vehicles in case you need to be towed out. Alternatively, join a desert safari with an adventure company who can arrange safaris, dune bashing and Bedouin nights. If you’re interested in sport, whether on land or in the sea, Dubai has it all to offer. Golf and horseracing are practically national pastimes, but if that’s not for you, you will find a club to suit you, from archery to yoga. The Dubai: Live, Work, Explore guide, published by Explorer, includes a full listing of clubs. For a social events and competitive sports leagues investigate a company called Duplays. Meeting new people in Dubai is not difficult and if you prefer to socialise without breaking into a sweat, or have young children to entertain, try the Expat Women’s forum for local coffee mornings and toddler groups. For a taste of Dubai brunches, read our article written for The Telegraph. The list of entertainment is endless, but here’s a few ideas of classical “must-sees”. · Burj Khalifa: the World’s tallest building opened in 2010, only six years after construction began. At one point a floor was being built every day and to keep the concrete from setting in the heat, before it reached its lofty destination, ice was added to the mix. If you want to visit the observation deck on the 124th floor book in advance. This not only guarantees your ticket but is also much cheaper than on-the-door tickets. Unfortunately, if a sandstorm blows in you won’t be able to change your visit slot. 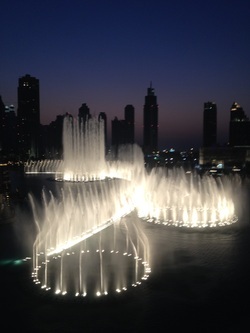 · Dubai Fountains: Spectacular, and free, the choreographed fountains dance in perfect time to music shooting 150m into the sky. See it from the comfort of a café at the Dubai mall or over a romantic meal at Souk Al-Bahar. · Burj al Arab: This landmark hotel, on its own little man-made island, looks like the sail of a boat. Famous for being the first seven star hotel, its opulence is evident in the gold-leaf décor. If the hotel itself is out of your budget try a restaurant with a view of the Burj al Arab at one of the surrounding hotels, or a picnic on the beach. · Jumeirah Mosque: Free tours (10am Sat, Sun, Tues Thurs) are available to give you a good insight into the Islamic religion and culture. There is no need to book, but dress modestly covering arms and knees. Women should also wear a headscarf. · Souk Madinat Jumeirah: Arabia-style architecture with boutique shopping, restaurants and a theatre. · The Creek: Experience old Dubai by watching life on the Creek. See wooden dhows overladen with goods, speedy abras (water taxis) toing and froing from one side of the Creek to the other, bustling souqs offering gold, spices and textiles. The Dubai Museum is a great place to start if you’re looking for historical context. 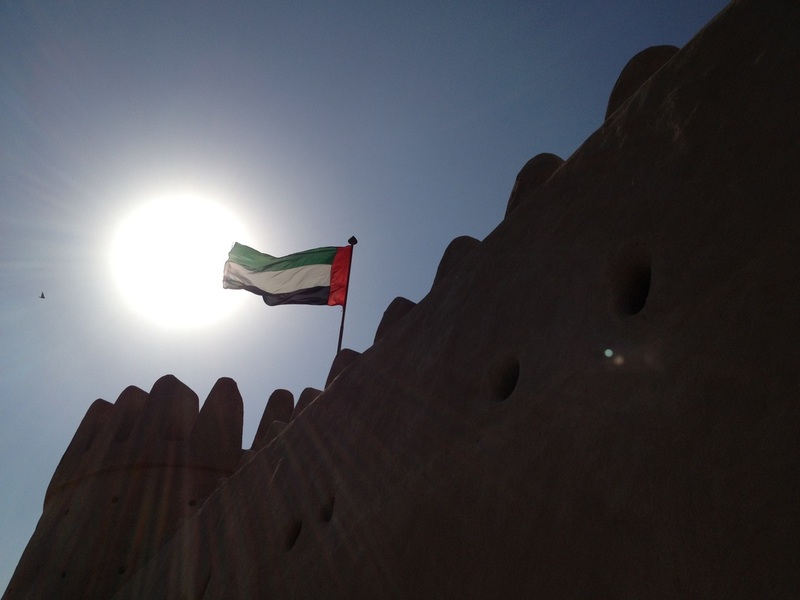 It is housed in the Al Fahidi Fort, Dubai’s oldest building, built in 1787. It is in the Bastakiya Quarter, Dubai’s heritage heart. · Global Village: Open during the winter months, this outside themed entertainment park takes you on a trip around the World. Different nations are represented in food, cultural displays, music and dance.